Happy weekend! It seems like I just did one of these posts a couple of days ago. Oh, wait - I did! But it's Sunday, so it's time again. I spent part of Thursday weighing my options regarding audio books. Priced them on iTunes and my Nook but at $24 a book (as opposed to the $2 for the CD versions I'd been buying at my library sale), it seemed like a monthly subscription to one of the services might be a better option. Or the library, where the books can be gotten for free, although I'm not sure I'll every get them them "read" in as short a time as they allow you to have them. Do you use one of the services? If so, which one and what are your thoughts about it? 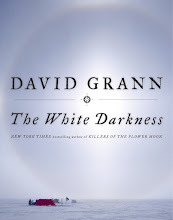 I'm really missing books on audio. Listened To: I started listening to the podcast S Town, which is done by the same people who did Serial. I'm only a couple of episodes in but it's definitely grabbed my attention. When I went to grab this image for this post, I found myself going down a rabbit hole of stories related to this podcast. I'm certain I'll find myself looking into some of the related stories again. Watched: An episode of Sharp Objects on HBO. I wish I'd read Gillian Flynn's book more recently so I could remember the story better. Also, watched a documentary about Hedy LaMarr. Such a beautiful, intelligent woman - such a sad life. Read: I haven't done much reading in the past few days. I found a new game to play on my phone that I haven't been able to put down. It's a good one for keeping my brain active but I'm already starting to bore of it - which is a good thing! Made: In the past couple of days? Not a thing, unless you count raisin toast. We've eaten out three of the last five meals. Today we need to eat salad! Enjoyed: Time with friends and family. Friday night we went out with friends for happy hour and, even though we'd just eaten dinner with them a couple of nights before, we still had to force ourselves to get up and leave three hours after we got there. Yesterday we went to Lincoln and spent several hours with my parents and then several more with The Big Guy's sister and her husband. We hadn't had time, just the four of us, in ages and it was so much fun and we didn't get home until much later than we had planned. Planning: Construction of a shadowbox table. My mom gave me an old family autograph book from 1877 yesterday and I suddenly decided that all of the old things I have like that need to have a home where they are protected but can still be seen. I'd like to build it out of wood pieces I already have for the most part, so my brain has been working overtime trying to figure out what will work best. Thinking About: Making a quick trip to my aunt's and uncle's this weekend to pick up some furniture they are kindly giving to Mini-me and Ms. S. They have such a lovely home and are such gracious hosts so it's always good to spend time with them. I just need to find someone willing to take a trip with me as BG will be off to his 40th class reunion. Feeling: Younger again now that my hair isn't grey any more; thanks, Adriana! Looking forward to: Dinner with work friends past and present this week. Question of the week: Our cat is still really missing her brother. She's not allowed to sleep with us because of my allergies (I need one cat-free room!) and some nights she sits outside our door crying most of the night. Any one had to deal with pet grief before? If so, how did you handle it? I still use my library's overdrive and hoopla frequently, but I am probably audible's biggest fan. They have a plan where you pay a flat fee and get all your credits up front, they frequently have BOGO and 3-for-2 sales, and you can roll over up to 6 credits per year if you don't use them all. Their customer service is the best... and you can return books you aren't happy with - no questions asked. I think I've been a member for 15 years now. I tend to use the library for shorter books or books I'm not sure about, but almost always use audible for longer nonfiction or classics that I know I can never finish in the time allotted. Good luck! I am going to have to keep an eye on being able to get through the books in the three weeks. I do hear nothing but good things about Audible and I may eventually have to break down and go that route, especially if it ends up being a bargain which it sounds like it does. Lisa, I strictly use the library for audio books. I use an app called LIBBY and download to my phone. You can build a holds list of 5 at a time (usually there is a wait so they don't all become available at the same time). I also reserve "PlayAways" from my system, a small pocket size audio book - you just need a AAA battery and your own earphones. 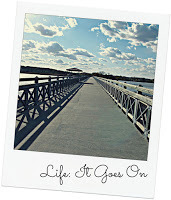 Just added Libby and it is so easy to use! 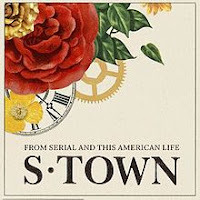 Definitely don't read any more S-town related stories until you're done with the podcast! :) I'm serious...they might ruin the ending for you. Such a wild tale. I loved it. As for audiobooks, does your library subscribe to OverDrive? You should be able to renew them through there, too. Hope you can find a solution! I loved, loved S*Town! It really was a wild ride! My library does do Overdrive so I have downloaded Overdrive's app, Libby and started getting books. So easy to use. I'm so sorry about your pet. So hard. All I've done is give them some extra love and treats and just be with them. That shadow box sounds amazing. I hope you get it all planned out and it works out great! I hope you post about how you make it and the final product! I use Audible and the library. If you can stand to speed up your audiobooks to at least 1.5, you should be able to get through them from the library! My library used Libby and I can speed it up to 2x normal speed. Granted, one must listen a lot more closely so you don't miss anything but for books that are pure pleasure I find I can follow along pretty well at that speed. Good luck! I did download Libby. What a great idea to speed things up! I did miss that on the CDs! 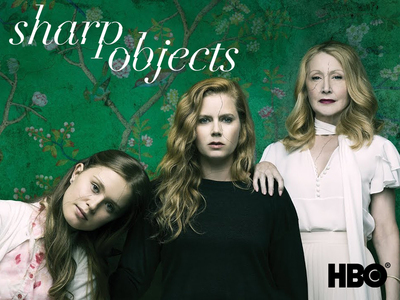 I really liked the book Sharp Objects and am interested in seeing the new TV show...but we don't get HBO so we'll have to wait until it hits one of the streaming services! Enjoy your week and your books! I think I did one of the Sync's books last summer, if I'm remembering right. I'll have to go get on the mailing list! I love happy hour just for the nibbly bits. It's only Wednesday but I am so tired. Work drama. 10th grade registration stuff tomorrow. Bleh. Right? The nibbly bits are really what I'm there for because I'm not going to drink enough to have saved that much in the long run (plus I tend not to even like what's on their specials).